~LITTLE LIP THEATRE no Teema"
Available on: Chijou no Senshi/Koko wa Paradise (Single), Sakura Taisen V New York Kayou Zenshuu (Album), Complete Song Box 2002-2006 (Disc 05 of 08), etc. (One Pair) Hajimeyou! (Sunny) NOW LET'S DANCE! (One Pair) Saa hakushu! (Sunny) JUST SING A SONG! It's time to start! / Now let's dance! ** (Sunny) LITTLE LIP'S sekai no koibito (One Pair) LITTLE LIP'S CHU CHUU! (Sunny) LITTLE LIP'S goraku no dendou (One Pair) LITTLE LIP'S CHU CHUU! (Sunny) LITTLE LIP'S hikari kagayaite (One Pair) LITTLE LIP'S CHU CHUU ! (All) NOW LET'S DANCE! JUST SING A SONG! (One Pair) Tanoshimou (Sunny) NOW LET'S DANCE! (One Pair) Kokoro kara (Sunny) JUST SING A SONG! Let's enjoy it / Now let's dance! From the very heart / Just sing a song! "Koi no Hassha ALL RIGHT"
Available on: Teigeki Kayou Zenshuu 2 (Album), Complete Song Box (Disc 02 of 08), etc. * Koi ni hassha OORAI! koi no hassha OORAI! Kikkake hitotsu de hassha OORAI! All right for love to depart! All right for love to depart! Under one command it's all right to depart! Koi ni hassha OORAI! Koi no hassha OORAI! Today's post is a special post, to celebrate the fact that... my Sakura Taisen New York Hoshigumi Live 2011 DVD had just been shipped hahaha. It was shipped yesterday, but my internet went down again (it's been a pain for the past several days T.T). Yes, this one is another Sakura Taisen tribute as I promised. So, to celebrate this small yet delightfull fanboy occasion, I decided to upload the theme song of the New York Theatre, the Little Lip Theatre. The song will be accompanied by my past work, the Kazegumi trio from the DaiTeikoku Gekijou (Teito's Theatre). What do the two songs have in common you ask? Simple: Both are performed by the support unit of the main cast, and both are TRIO songs. It would've been nice if I included the Mell & Ci song from the Paris Theatre Chattes Noires, but since it's a duet, It wouldn't fit... (beside the fact that the song is the most feminime of all the theatres ^^;). The first song, as I said, is performed by the duo One Pair (Plum Spaniel & Anri Yoshino), with the addition of the overly excited and eccentric theatre manager (as well as the Combat Troupe COMMANDER) Michael Sunnyside. Plum, who was re-named as Cherry Cocker (What? o_O bad name choice? Agree...) in the US version of the game, handles the food and beverage shop of the theatre, while grumpy Anri is in charge of the merchandise shop. Sunny, as the shortened nickname for Sunnyside, is the manager, who probably loved to sing and dance, and perform on stage even more than the Star Five (nick name for the 5 members of New York Kagekidan). His name actually fits his personality so much: a ridiculous, obnoxious yet brightly cheerful guy who leads the theatre with a huge smile while shouting "LIFE IS ENTERTAINMENT" all the way. He's the only commander among the 3 cities squad with more than one solo songs, and always had a singing part in the New York CDs. Ichirou Oogami has several solo as well, but most of them are done BEFORE he was appointed as Commander to replace Ikki Yoneda. 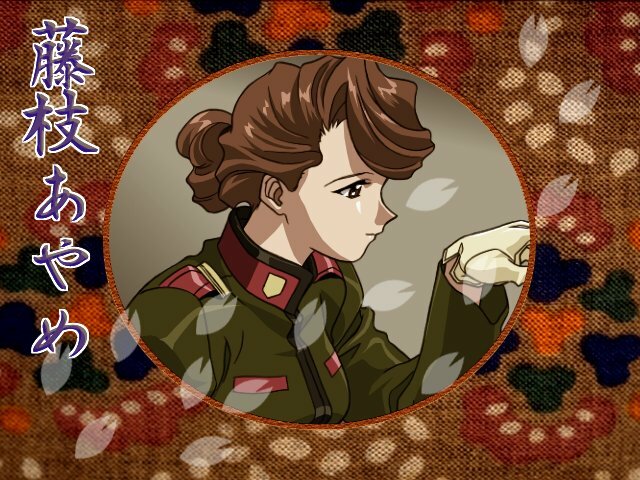 The second song, is included in one of the chapter of the Sakura Taisen 2 game. The Kazegumi (Tsubaki Takamura, Yuri Sakakibara, Kasumi Fujii) is the support team for the Teikoku Kagekidan. The secret fangirl of Maria, Tsubaki handles the merchandise/gift shop (just like Anri), the gossip girl Yuri is in charge of publication, and the gentle and mature Kasumi is doing the administrative for the theatre (tickets, sales, and others). The song actually reflects a combination of their theatre's role as well as their combat's role. They are the unit under Kaede Fujieda, which are in charge of the transportation (using speed train Gouraiga, steam aircraft Shougeimaru, or the great battleship Mikasa) and armament support for the Hanagumi, hence they are accustomed to the phrase "HASSHA OHHRAAIII" or "All Right to Launch!". That's where the title of the song came from. The theme of the song however, is related to their theatre's role, cause in the chapter where they inserted this song, the 3 took over the handling of the theatre, to let Ichirou Oogami spend a romantic day with one of the Hanagumi of his choice. A date? OF COURSE hahahaha. So it's no wonder they said, "It's All Right for LOVE to Launch!". For fans, this song is one of the highlights of the 2nd game soundtrack, why? The atmosphere of the song, is no different than "Koko wa PARADISE" because it's a jazzy filled upbeat dance song. The moment you start to the song, you'll be tempted to just dance along or shake your body. It's fun, and somehow I get the feeling that this song is actually what triggered the creation of the 1st song. Yup, dare I say, that both of these songs are broadway-styled Sakura Taisen masterpieces that showcased the awesome quality of its music (by the one and only Kouhei-sensei). The challenge in recording both of these songs are... they are TRIO songs! Whereas I'm the only one singing... Yep, I did 3 take for the different parts of the 1st song, and 2 take for the 2nd song (cause it's mostly Tsubaki singing with Yuri and Kasumi as backups). The vocal recording step is enjoyable, because I really had fun singing these songs. The next step is the annoying one though... the editing and mixing to produce the final result. It takes quite sometime because I need to handle each track separately, meaning I have to do it 3 times. A duet is not too much of a problem, because the work is only 2 times. 3 times means extra time, and harder mixing (adjusting volume, panning -though I had lots of fun with it-, and balancing the vocals). Despite the problems, all the hardwork paid off, and I really enjoy the result (perhaps because I'm already biased with these song from the start hahaha). It could be much better, but thankfully I'm not too much of a perfectionist. I look forward to be able to re-record these songs, but as a REAL TRIO though. I really want to sing this song with my bros (Mick, Ela... God... where the heaven are you guys now T.T), though it seems like a very farfetched idea. I would really love if anyone from the web, from around the world, want to tag along with me to sing this brilliant numbers. I'd be more than happy to re-do it again. One Pair & Sunny with DANDY Dan - Koko wa PARADISE (from Budoukan Live 2007) > This is the very first live appearance of Plum Spaniel... a collaboration with DANDY Dan. Dandy Boss and Sunny are the best male singers of Sakura Taisen, so their combo is superbly amazing! Baragumi - Koi no Hassa ALL RIGHT (from Tsubasa Performance) > Are they guys? YES... Baragumi are male-lover crossdressers who spoofed the Kazegumi and sang this song since the girls couldn't make it to all showdates XD. This performance is hideously yet hillariously ENTERTAINING, they even made the audience danced away, on their very first 'very energetic' live appearance (even now not so good vocal-wise). The Baragumi is one of the comedic elements of the show that you'll simply miss when they're not around. - It's time to BLEACHed up your LIFE!! !